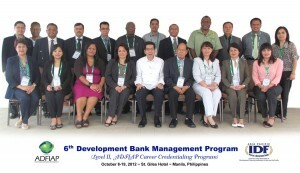 ADFIAP’s Institute of Development Finance (IDF) conducted its 6th Development Bank Management (DevMan) Program on October 8-19, 2012 at the St. Giles Hotel in Makati City, Metro Manila, Philippines. Sixteen (16) DFI officers from the Federated States of Micronesia, India, Malaysia, Nigeria, Vanuatu and the Philippines, who have successfully completed the two-week course, were granted the credential, “Certified Development Finance Executive”. A total of 74 officers of DFIs have now been already granted Level II credentials. DevMan is Level II of the three-level ADFIAP Career Credentialing Program (ACCP), a process of accrediting and recognizing professional competence of development bankers. DevMan consists of two main modules. Module 1 covers financial management system, loan management, performance management, credit analysis for investment loans, and treasury operations while Module 2 delves with issues on people management, cultural nuances to improve communications, and analyzing and solving problems in development projects and operations. It also covers decision-making analysis and managing project to ensure success. The module also includes key performance indicators (KPI) reporting framework and sustainability reporting. Apart from in-depth classroom discussions, the participants made institutional visits to the Land Bank of the Philippines, where they were briefed on the Bank’s operation management, financial management , strategic management of a universal bank and how it fulfills its development mandate and achieve revenue targets; to the Philippine Export-Import Credit Agency (PhilExim), where they learned on the agency’s organization, management and special issues in a guarantee bank; and to Esquire Financing, Inc., where they were briefed on the company’s operations and financial risk management strategies. The program resource persons were led by Dr. Alberto Pena, Professor and Associate Director of the Office of International Studies and Programs at the Illinois State University, U.S.A., Mr. Orlando P. Pena, former ADFIAP Secretary General and President of Asia Business Consultants (ABC) and Mr. Enrique Florencio, ADFIAP Head of Knowledge Management Unit and Sustainability Officer.